I loved this nursery done by Shelter's Julie Richard. Matters of Style included it in this great lineup of nurseries. Stripes, check. Zebra run, love it. Lucite stool, fabulous. I love everything about it. Praise Julie Richard! I absolutely abhor nursery's that are too childish. This one is very chic! Nursery?! 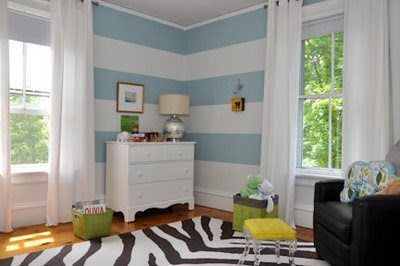 Shoot--I'd take that as my room, minus one oversized zebra rug. Scott, I could't agree more. I cringe everytime I see someone pushing a plasticy-cartoon character stroller down the street and think to myself that their nursery would probably give me hives. Love it all. And you don't need to change a thing except for the crib to a bed as the child grows.